Posted in: St. Louis Cardinals. Tagged: Angels, Major League Baseball, Major League Baseball All-Star Game, Shelby Miller. Once upon a time I went to a Springfield Cardinals game (surprise). I got there early for a give away and right as I walk through the gate, low and behold, there he is. Shelby Miller is standing casually at the gate. Oblivious passer byers are ignoring him, but I know exactly who he is. I briskly prance over to the counter to buy a score card then I nervously walk up to him and ask for an autograph. That same autograph is sitting above my bed in my room. It’s a beautiful thing. Now I get to see him pitch in the big leagues and not just pitch, dominate. Despite his last few starts, Miller is still 8-6 with a 2.79 ERA and 101 SO. He also holds a 2.1 BB/9 inning rate. Not too shabby. Shelby was RACKED in his last start, throwing over 50 pitches in the second inning. But there are reports of him looking closely at the tape and trying to figure out the problem. Part of it is innings. He is rapidly approaching 100 innings, and might just make it tonight. He could use a rest and maybe he’ll get one at the All-Star break if he doesn’t make it. As much as I’d like to see him there, I would rather see the rest. But more power to him if he gets there. Miller somehow went from the no. 5 starter to the no. 2 in my mind. It’s crucial he turns it around heading into the 2nd half. It’s only going to get hotter. His home/away split is dramatic, posting a 1.59 ERA at home and a 4.22 ERA on the road. He’s striking out less and walking more on the road. He’ll need to change that tonight against the Angels. He’s getting jumped on early- Opponents are hitting .323 of him in the 1st inning with a 4.50 ERA. Opponents are jumping on his fastball- They are hitting .333 of his 1st pitch of the AB, coming right after that 1st pitch fastball. Opponents are hitting .164 in innings 4-9. They are hitting.041 on an 0-2 count. Miller can bury opponents when he works efficiently. He’s got a smooth, repeatable delivery (ehem… Lance Lynn) and I would expect him to turn it around. It’s going to be fun watching him face Pujols but the real excitement will be tomorrow when Pujols whiffs at Waino’s curve. It’s going to be fun and be sure to tune in. Posted in: St. Louis Cardinals. 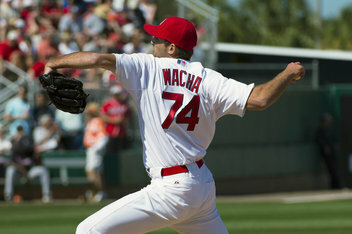 Tagged: Major League Baseball, Shelby Miller, Wacha. The day is finally here. I say finally, but he wasn’t been around that long, being drafted just last year. 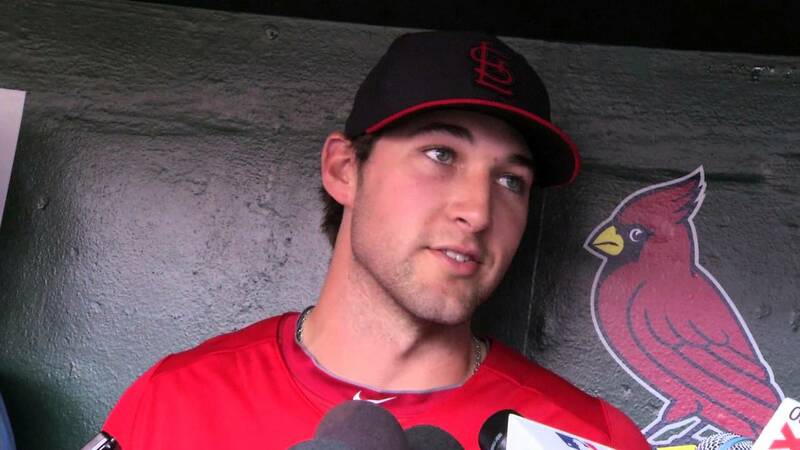 By now us Cardinal fans are used to rookie debuts but none has gotten this fan base more excited than Wacha. Is it out of control? Absolutely. But just for this one day its okay to be overly excited and have unrealistic expectations. It’s part of being a fan. So go out and enjoy it, watch this kid show what he’s got in him. I think as Cardinal fans, we get so excited for rookie phenoms getting called up because it represents a change in the Cardinal culture of the past. We’re used to hardened, veteran teams that have a lot of experience. These kind of teams is what I was accustomed to to seeing in the La Russa era. But a young manager and a lot of talented rookies? Seems like a good combination and that is just one of the things that makes Matheny so great. Are there concerns? Of course. Things like a measly K/9 rate of 5.8 and a heavy inning load coming out of college. But just for today, put all that behind you and witness to future without anxiety. Do you remember this kind of hype with Shelby Miller? I sure don’t. Although the slap on the hand by the organization for underage drinking probably didn’t help his case. I still like Miller and I still have his autograph from when he was in Springfield. 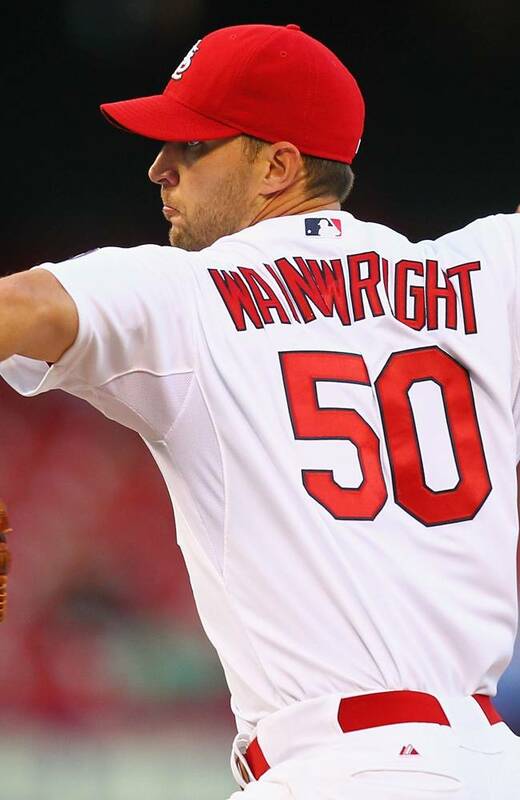 (Man it’s great living down here) Wacha has drawn Wainwright comparisions on his demeanor and here’s to hoping we see a Wainwright performance tonight. Posted in: St. Louis Cardinals. Tagged: Baseball America, Cardinal, Carlos Martinez, Shelby Miller, Springfield Cardinals. Remember when RHP Carlos Martinez was hyped up almost as much as Shelby Miller? Scouting Report: Martinez is an aggressive pitcher with a fastball that regularly hums at 94-98 mph and hit 100 in his first Springfield appearance. He has a biting curveball and a changeup that’s more effective when he doesn’t throw it too hard. Both could develop into plus pitches. He has a natural delivery but sometimes strays from it and his command wobbles. Some scouts see him as too small to handle starting, but his frame belies a wiry strength and his efficient mechanics will help. 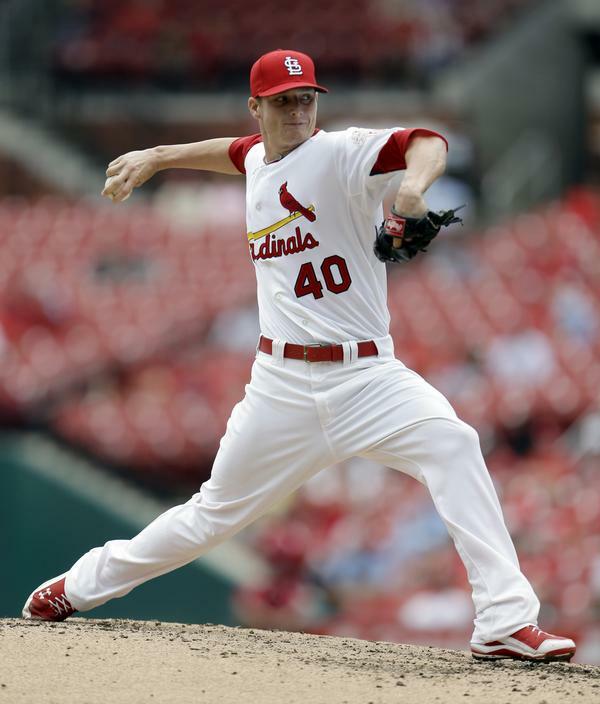 So in the well documented Cardinal’s 5th starter competition where was this guy? How about stuck in the Dominican Republic. He couldn’t get his work visa approved and therefor couldn’t report to spring training. I personally really like Carlos Martinez. He’s a flamethrower with a nasty breaking ball. Living in southwest Missouri, I love getting the opportunity to see these young guys on the Springfield Cardinals. Martinez certainly passes the eye test. 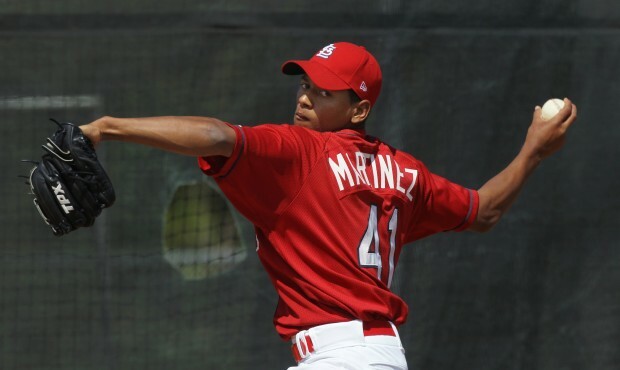 Last season Martinez went 4-3 with a 2.90 ERA and struck out 58 in 71 innings pitched. He’s off to an understandably slow start this year but everything I’ve heard suggests that he stayed focused and reported fit and ready to go. Carlos should be on the fast track to AAA and may enter the Cardinal’s bullpen pitcher later this year. If you forgot about him, you’ll sure be hearing his name soon. 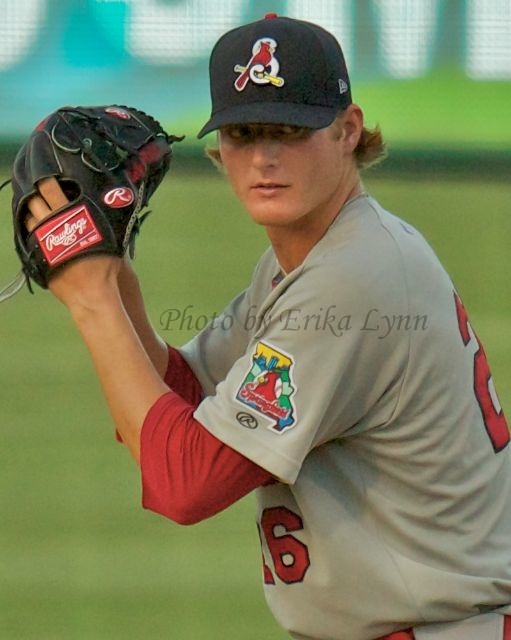 Stay tuned for my evaluation of touted Shelby Miller.